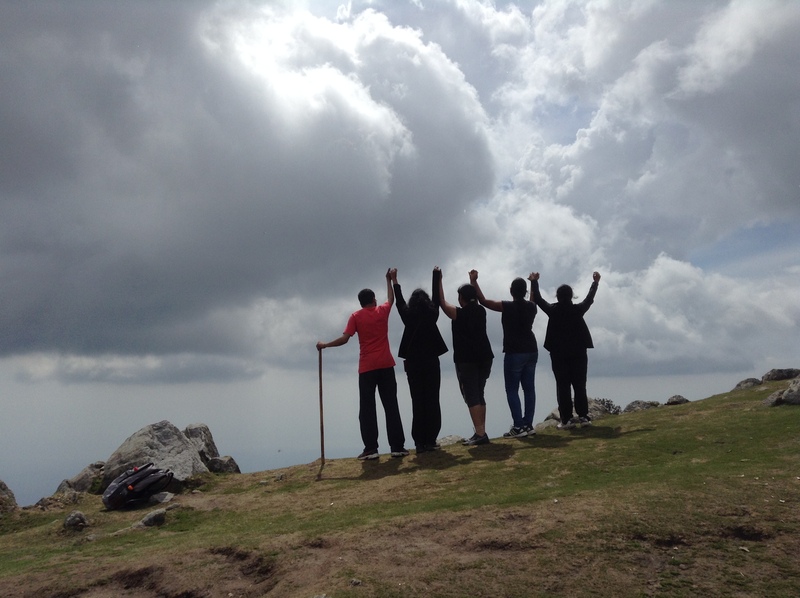 Seven of us set out to Dharamshala for a final trip of our college days, the so-called ‘psenti trip’. 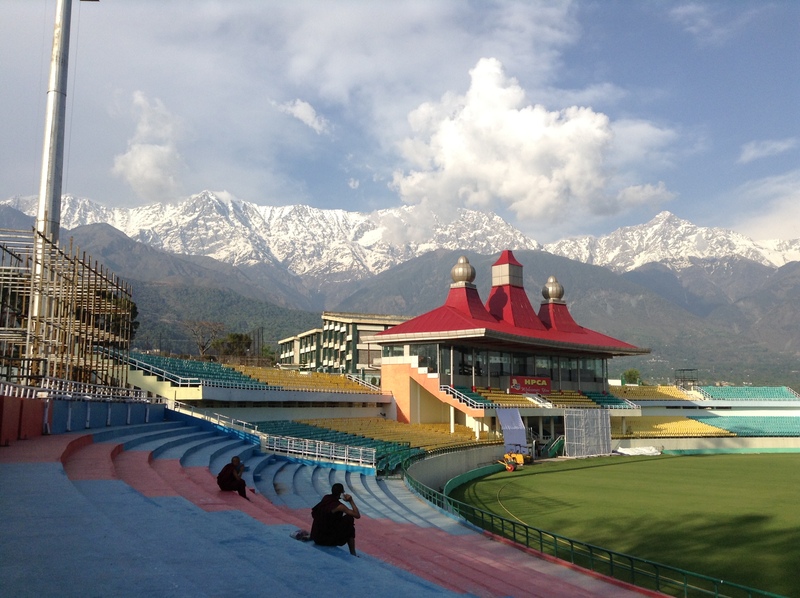 Located in the shadow of the Dhauladhar range, Dharamshala is a visual treat for any traveller. Snow-capped mountains, valleys, deodar and pine trees, monasteries and more. In short, religion, nature, serenity and adventure all packed in one trip. 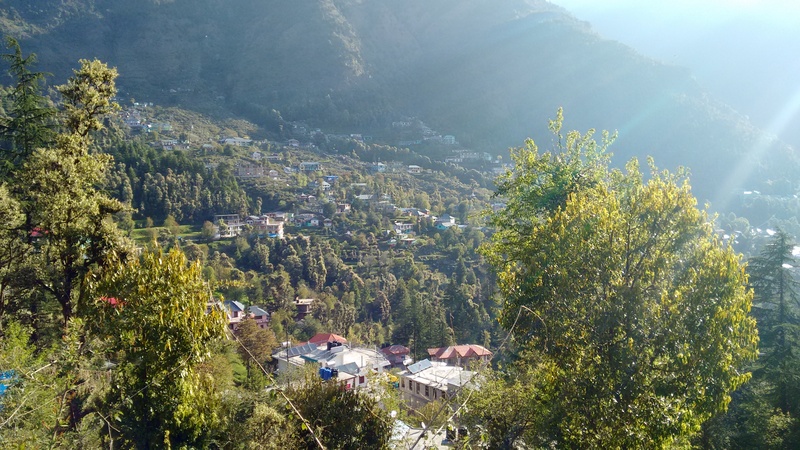 Lower Dharamshala is referred to as Dharamshala, the middle part is known as Kotwali Bazar and upper Dharamshala(9 KM from Dharamshala) is called McLeodganj. McLeodganj or “Little Lhasa” is home to the exiled Tibetan government and is known worldwide for the presence of the Dalai Lama. 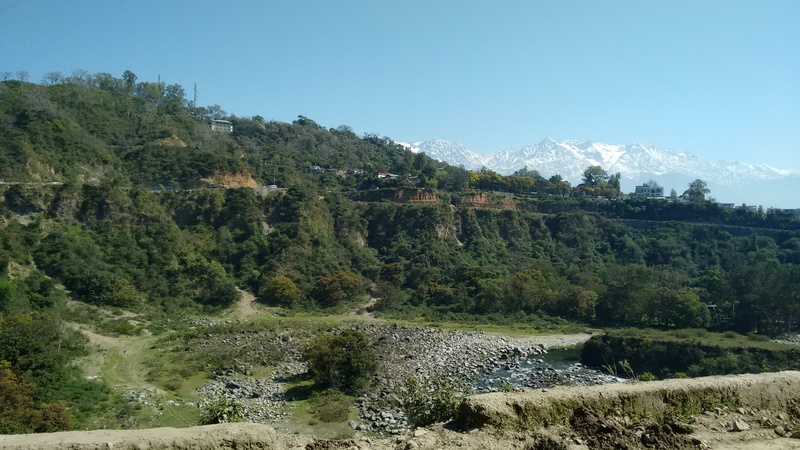 The journey from Hoshiarpur to Dharamshala had some breathtaking views and we passed through many beautiful villages like Gaggal, Chetru and Sarah set in the beautiful Kangra valley. 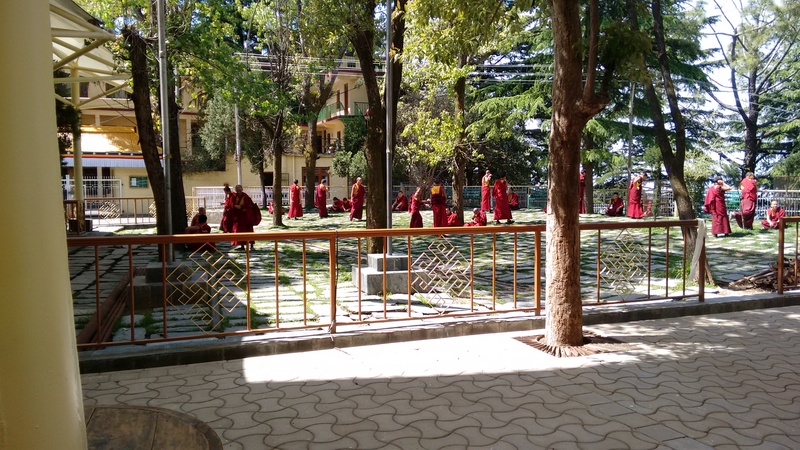 As we went from Dharamshala to McLeod, there was a striking difference in the people and culture of the two places.Most of the people in Dharamshala were Indians but as we moved up to McLeod, there were many Tibetans and foreigners (mostly visitors). We did not pre-book any hotels, but this wasn’t a problem. Many hotels provide cheap accommodation and have nice view of the city and mountains. We had a lunch of momos and thupka and started to the Bhagsu Falls. Bhagsu Falls and Bhagsunag Temple: The Bhagsunag temple is about 2KMs from the city square and is an ancient Hindu temple dedicated to Lord Shiva. The main attractions near the temple are a public swimming pool and the Bhagsu waterfall (which is 1KM further away). We visited the temple and started walking to the Bhagsu falls. There was a neatly paved cement way to the start point of the falls but a few of us decided to take the rocky way beside the fall to make it more adventurous. It isn’t a great waterfall but is definitely worth a visit for a picturesque view of the mountains. The water was amazingly clean and cool. Go there for an evening walk. We reached back around dinner time, so we went around the city square and market place and walked back to our hotel. Dharamkot: Right from our hotel there were a flight stairs leading to a steep stony path, set amidst the mountains with deodar trees. 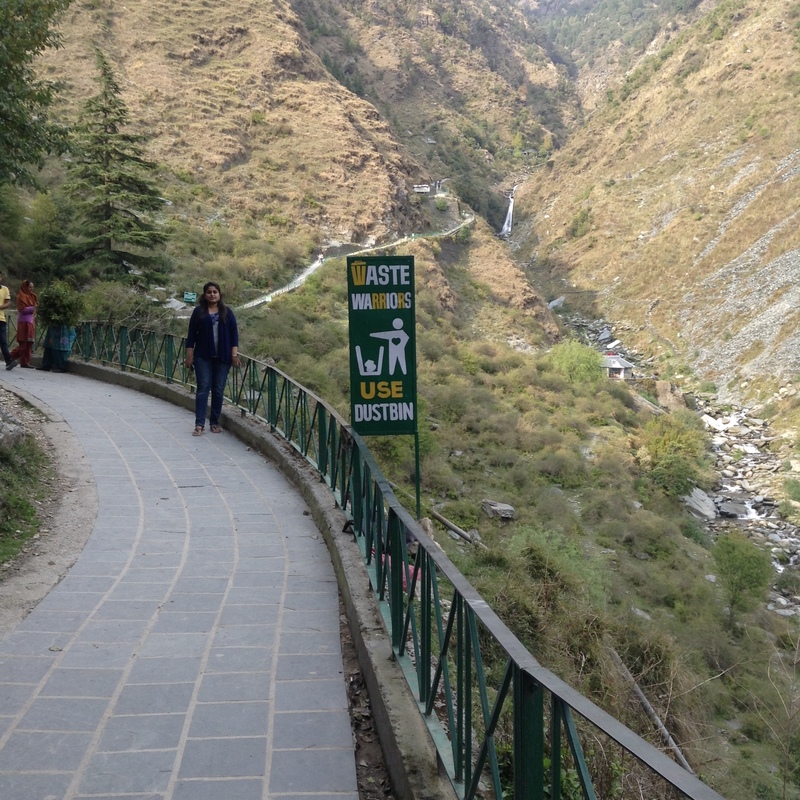 We took the path all the way to Dharamkot, a small village 2KMs from McLeodganj, passing through the Regional Mountaineering Centre and Tushita Meditation Centre. 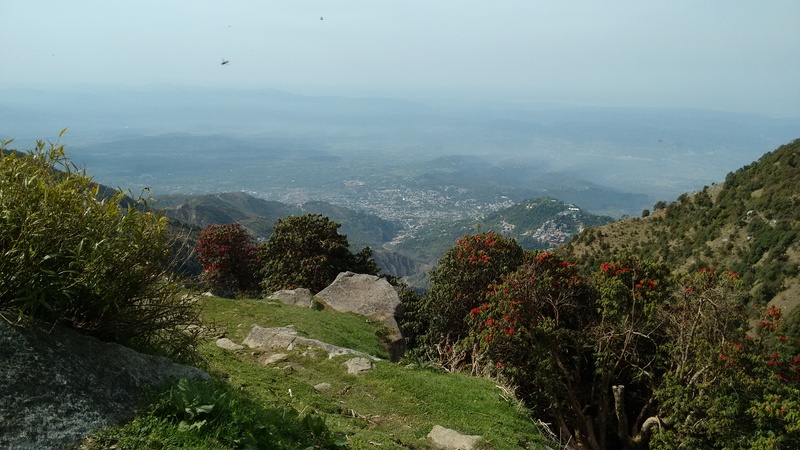 The village provides a panoramic view of the Dhauladhar ranges and the Kangra valley. The village is in the crest of a hill and has colorful houses and terrace farming. Here, you can find a pleasant reading spot and get yourself a tea from the chaiwalas before starting your book! Tsuglagkhang Temple: This is the main temple where his holiness, the Dalai Lama, gives his teachings. 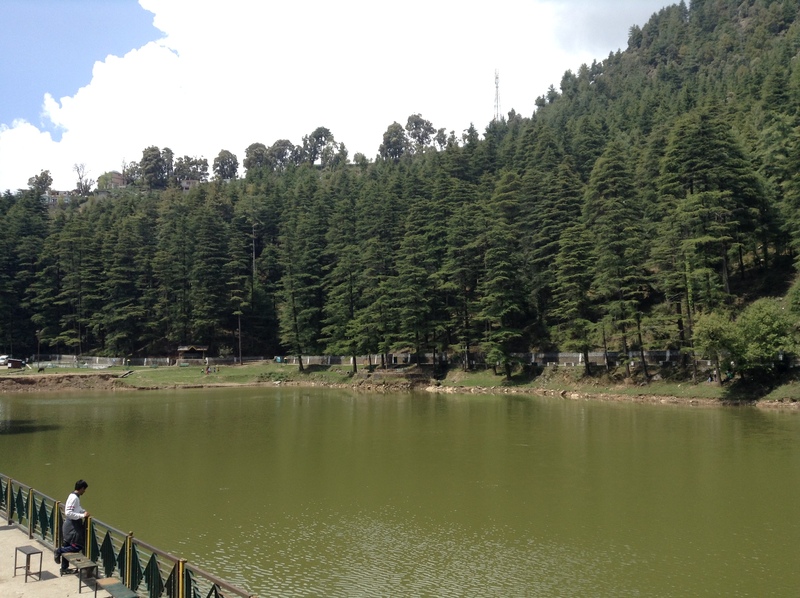 Many visitors worldwide come to McLeodganj every year to visit this holy place. It has a huge shrine of Shakyamuni Buddha coated in gold and the shrine of the Tibetan guru Padmasambhava to one side. You can see monks chanting prayers in front of the shrine which creates a pleasant atmosphere. 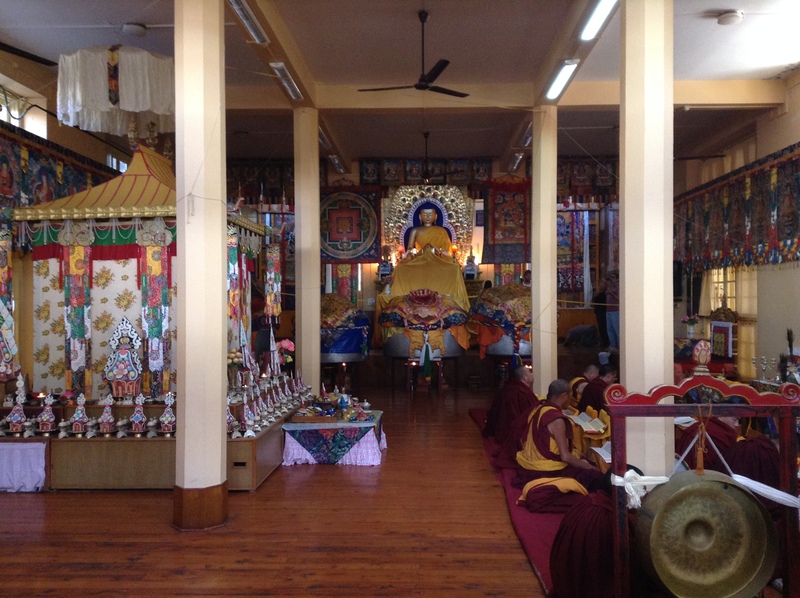 Inside the temple complex, there is also the Kalachakra temple, Tibetan Museum (which was closed when we went) and the residence of the Dalai Lama. The shrines were huge and quite artistic. One can see some splendid Thangka paintings hung around on the walls. During afternoons you can see the monks debating, in a theatrical style ,where a standing monk flings his arms and claps while another sits passively. This is an essential part of the training for young monks where the standing monk questions the thesis of the defender and the defender occasionally makes a counter point. We also came across monks making colorful mandalas (a spiritual symbol in Hinduism and Buddhism) and lighting prayer candles.Once outside, you can find a number of shops selling souvenirs, Tibetan singing bowls, Thangka paintings, prayer flags and more. St. John’s Church in the Wilderness: Situated in Forsyth Gunj, this Anglican church is set amidst deodar forests and built-in neo-Gothic architecture. The stained glass windows are quite attractive. There is a grave memorial of British viceroy Lord Elgin and a Christian cemetery at the exit. After the church, we started walking to the Dal Lake. Dal Lake: We walked nearly 3KMs to reach Dal Lake. We were disappointed as there wasn’t much to see there neither was the lake very pretty. 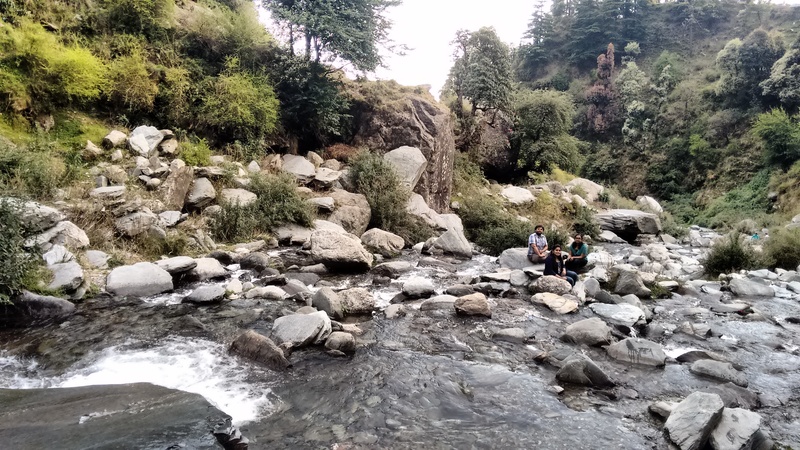 It is a picnic spot for families and the mountains with deodar forests were the only thing worth watching. This lake is considered sacred and a religious fair is conducted in the month of September which apparently enlivens the river. Other visitors told us about Naddi, which was higher up and is a good viewpoint. But we were too tired, so we decided to have lunch and head to the cricket stadium. Cricket Stadium: The HPCA stadium is situated at an altitude of 1,457mts above sea level and is probably the most scenic stadium in the country. It is set against a backdrop of snow-capped Himalayas and is very well maintained. We sat there watching the mountains and discussing religion and philosophy. Cricket fans should definitely visit this stadium and so should others, for it’s admirable beauty. 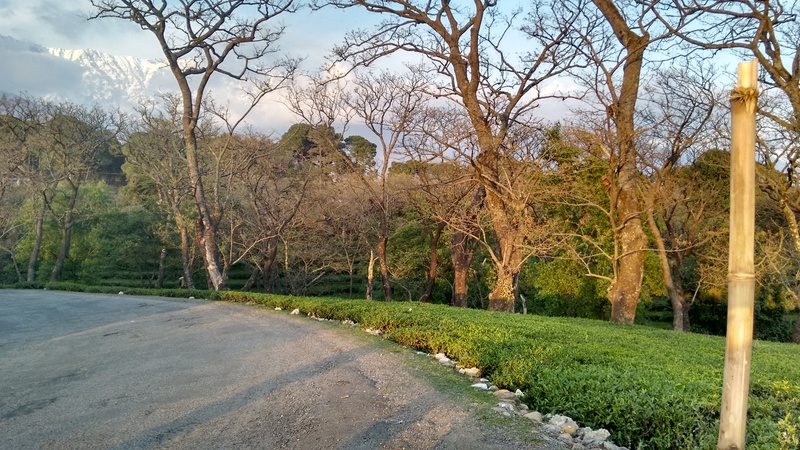 Tea Gardens: We stopped by the tea gardens to watch the sunset and get a few pictures. There were lush green tea plantations spread across many acres of land on both sides of the road. Nice place to watch the sunset. Palampur, a two hour drive from Dharamshala, is more popular for it’s tea plantations and is the tea capital of northwest India. Post-dinner, we went to hire a guide for triund trek since many people who have been there suggested we take a guide along. The local tourism people said they would charge around Rs 2500 for the guide (no night stay) which we thought was very costly. So, when we spoke with our hotel manager, he asked one of his workers, who worked as a guide previously, to take us for the trek. He charged us only 800 bucks. 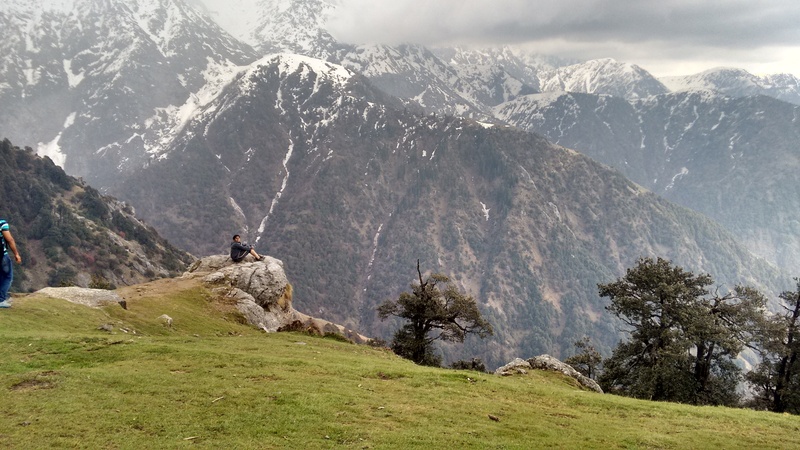 Triund Trek: I might run short of adjectives to describe the brilliance of this trek. This was the best part of the entire trip. We started the 7KM trek at Galu devi temple at 8 A.M. 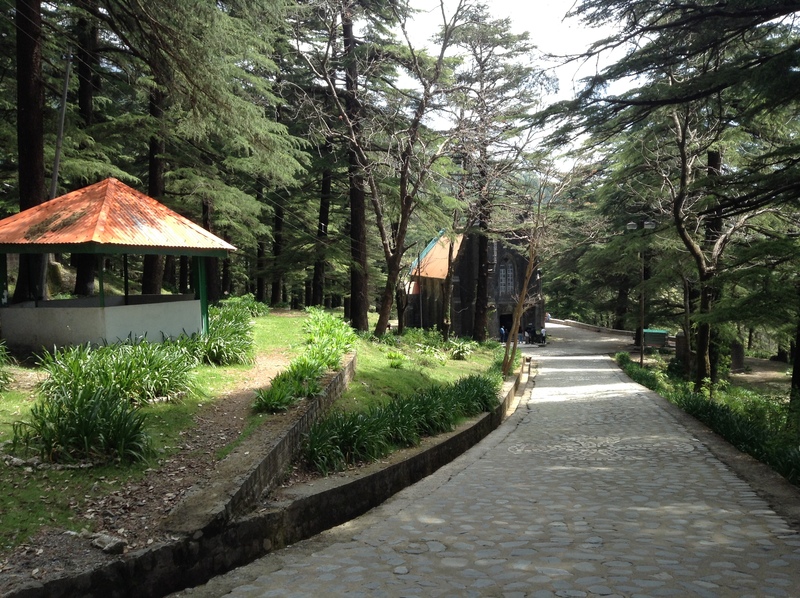 The rocky trail was well set and surrounded by oak, deodar and rhododendron trees. The red and pink rhododendron flowers throughout the trail and the majestic mountains left me marvelled at nature’s creations. Everyone heaved a sigh of relief when we reached the Magic View cafe, which is halfway point of the trek. We had some delicious Maggi and eggs but they were very expensive. In about the last 2KMs, the trek got a little tougher and the trail wasn’t very well set. And we could finally see the snowline! The trail was moist and slippery with snow at a few places and thicker forests of rhododendrons and deodars. We managed to reach the top where we were greeted by chilly winds. We were stunned by what we saw in front of us. The mighty Himalayas in all their brilliance, with clouds hovering above, were before us. It took quite some time for what I saw to sink in my head. We were admiring these hills from the stadium the previous day and we were on those exact same hills today. This place was 3000mts above sea level. While we were there, we saw the weather change from rainy to sunny to bursts of really tiny hail stones to sunny again. I couldn’t have asked for more; except maybe for a rainbow. We stayed there for a while and started the downhill trek around 4 P.M. The descent was difficult for the first 2KMs because of the rainfall. It will take around 4 hrs for the uphill trek and 1.5 hrs to finish the downhill trek. To the most amazing trek and friends! The following morning we went to Dharamkot for a walk and visited the Tibetan Institute of Performing Arts. But, there weren’t any festivals going on when we went. We returned to Hoshiarpur to catch our train and stopped for a while at the Kangra fort to enjoy the view. You can check the photo gallery below. Thanks for reading!